If we in Britain were Ancient Egyptian, we would be about to celebrate the Feast Of The Tail. Or, more succinctly: Sed. The celebration of fifty years of a Pharaoh’s rule. And while we are celebrating sixty, the principle of marking the milestones is still there. Every Pharaoh had special ceremonial robes. And these robes had a tail. Ancient historians have speculated whether this indicates that originally the ruler would have worn animal skin, with tails outstretched behind. The feast to celebrate a ruler’s continued reign replaced a much darker affair. For in the mists of time, they would ritually sacrifice a ruler after fifty years. The very idea. Our English Kings wouldn’t stand for being bumped off after fifty years of service. Not after handling five decades of the disgruntled, acerbic inhabitants of this strange group of islands which fights so very much above its weight. Henry III spent his 56 years of rule battling belligerent barons over the contents of the Magna Carta; he was just nine years old when he began his rule. 1266 was his jubilee year: 50 years of trouble and strife. I wonder if he felt like celebrating. In 1277 Edward III crossed the fifty year milestone. The founder of the Order of the Garter was 14 when he became king, and celebrated his jubilee year by shuffling off this mortal coil. It was George III who saw fit to celebrate the coming and going of the fifty year mark. He hated the stifling ceremonial of the London Court, and instead came to his beloved Windsor Castle to mark the passing of the decades, holding a quiet service at St George’s Chapel, Windsor Castle, followed by a firework display at Frogmore House, and an ox roast on Bachelor’s Acre. He almost made it to his sixtieth year of rule, dying just months short of his diamond jubilee. But Victoria made it to her sixtieth year, indeed trotted past it. A strange business, the service outside St Paul’s Cathedral with the Queen sitting in a carriage: but it was gratifyingly public, for a queen who had disappeared from the public eye to such an extent. The country went jubilee bonkers, and the modern jubilee tradition of festooning buildings and taking over the streets for parties was born. Our monarch is the fifth to reach fifty years. And it’s easy to underestimate her impact: a spine to the governments which arrive and depart, a familiar face even when there’s a new prime minister; the person you sit down to watch after roast dinner and christmas pudding on December 25th; the solemn figure in designer pastels who walks the streets to speak to crowds, who has begat a dynasty which captivated the world with its stories, both glorious and scurrilous. We, here in Britain, have been very fortunate. Our Queen shares with Elizabeth I and Victoria a sense of duty rare even in women in this day and age: for a wife and grandmother she is still, like Oriana, wedded to her country. I was a child for the celebrations of her 25th year, bedecked in blue flares with white t-shirt and a red jumper. My mind lives in the present and has trouble with my own memory: the seventies are a haze of muddy brown and dreary pop music. I believe everyone got a coin, and we all partied accordingly. And now I am bringing our children to celebrations, thirty-five years on. Felix and the Princesses dressed in clothes corresponding to the decades of Elizabeth’s reign. Felix bagged the seventies. Phil found a little shop in Pimlico which sold psychadelic Huggy-Bear-suits, and brought one home, and his son went proudly into the seventies, enjoying it much more than we ever enjoyed the real decade. And Al? 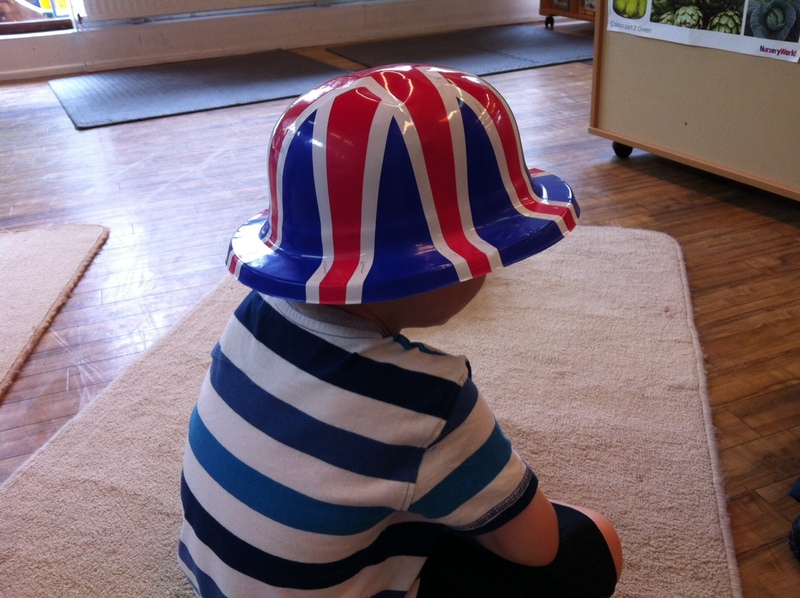 I pottered off with him to his jubilee celebrations yesterday. It was a games-only extravaganza, outside and inside, with a slap-up royal picnic and jubilee hats and mats and flags to wave enthusiastically. We played hard and Al sported the hat with something which looked like national pride, though it may have simply been that he could not see under the rim. We are on the edge of our weekend to fete sixty years of one woman sticking with us through thick and thin, in times of press coverage favourable and unfavourable, of public perceptions sometimes respectful, sometimes critical. We wait. And there is something jubilant in the air. 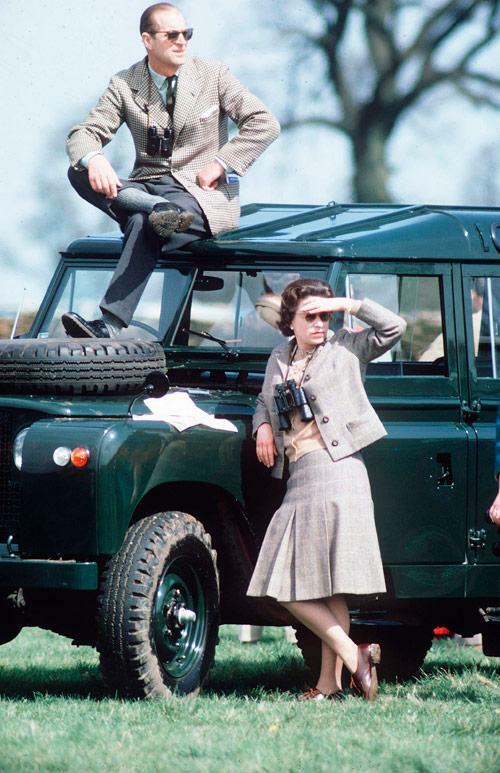 Posted in Quirks of History, Shrewsday MansionsTagged Diamond Jubilee, history of the jubilee, jubilee, Queen Elizabeth IIBookmark the permalink. Not a fan of the monarchy at all – but I do respect her ability to keep her gob shut for 60 years. That is quite a skill, Jim. Agreed – she must be starving the poor thing! She is to be admired for her sense of duty and all that hard work, which lets face it must get a bit ho-hum boring after a few decades of handshaking and small talk. I like the sound of the feast of tails – always wanted a tail! Huge fan of the monarchy and I think she’s done an amazing job and kept the promise of her 21st birthday. She has 🙂 What a lady. This was a great read Kate, every word of it. You and Big Al have really put me in the Jubilee mood. Whatever we say before hand, we shall all have a good knees up with our neighbours, communicate more with each, and have a jolly good time. Here, here and three cheers and all the sort of greetings that go with a Diamond Jubilee. I’m enjoying the festivities from afar, even more so with your post today, Kate. Enjoy it and good for you. You are giving Felix and Maddie, Big Al and the princesses, even your and Phil that thing we hold on to through the years – memories. Yes. Penny: a milestone for a country, a queen or a president is a milestone for us also: a marker by which we measure our lives. That question: “Where were you when….” helps us mark time. I have one of those coins from 1977, and I remember that Jubilee year only because I lived it vicariously through my neighbor. It was what truly made me take note of the QE II, and I’ve followed and admired her for most of my life as a result. I find it fascinating that, as her reign has progressed and the world has so markedly changed, she has never given a press interview. Good for her. She never should. Her dedication to the job speaks for itself. Few people in any position could perform a job in the public eye (or in private for that matter) with the dedication she has for sixty years. I will be raising my own glass to her this weekend. Indeed: she is full of integrity. And consequently, in a time when it could so easily have slipped away, the institution of the monarchy is valued by its people, despite the rocky time after Diana’s death. It is an amazing achievement. Future monarchs can thank her for their continued existence. Queen Victoria (in 1897) is the only other monarch in the histories of the United Kingdom, Canada, Australia, New Zealand and a few other Commonwealth realms to have celebrated a Diamond Jubilee. Quick fix needed: And now I am bringing our children to celebrations, twenty-five years on. ~> thirty five years on. Queen E ascended the throne in 1952 . . . she’s been sitting on it longer than I’ve been alive! George III almost got there, but not quite…Go Liz, indeed, Nancy. We are very lucky. As an American, I find this fascinating. Hope the festivities are fun and bring you pride! Must go and take a look, Tandy! I shall endeavour to keep you informed, Debra 🙂 I do hope your Dad is doing ok. Thinking of you lots. Uneasy is the head that wears the crown; especially if the wearer is unsure if dinner is for them or if they are being had for dinner. Your queen and I share our special years, decade by decade. I wish I could keep my cool as she does. I have great admiration and respect for HM. More so, by far, than for any other of today’s leaders, actual or nominal. I also think the monarchy is a valuable asset the republicans would sorely miss if it went. Look how jealous the Americans are, though they would die under torture rather than admit it. Oh Kate, this caused me to run to the cupboard and pull out a bottle of beer that I’ve been saving for years. For some reason I thought it was from the 25th year but in fact, it was from Princess Di’s wedding. Although it’s looking quite shabby, I’m hopeful that one day, I can put it on ebay and send my kids to college.